Our single clutch is suitable for regular and tuned vehicles. 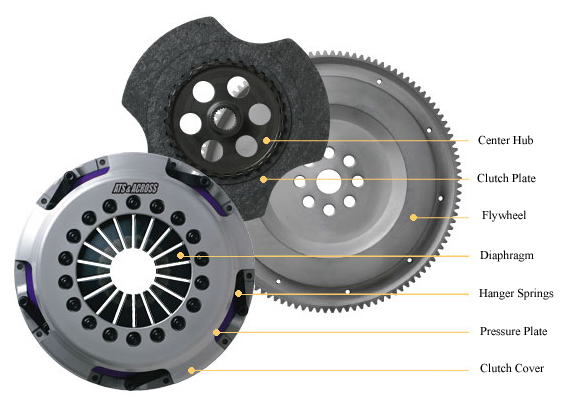 Using the latest technology, we have improved the materials of both the clutch disk and the pressure plate. We successfully achieved torque delivery that is almost double that of the conventional type of clutch, with a maximum of 70kg/m (430 lb.ft)*, combined with high reliability. The excellent performance at half clutch makes street driving easier, and the use of CC composite made possible dramatic weight reduction and improved synchronization in order to achieve a pleasant feel while shifting gears. With the introduction of Pro-spec II, ATS successfully made the pedal effort lighter than stock which has enhanced your driving comfort and pleasure immensely. Thanks to its superior properties, our damper-less carbon disk has shock-absorbing capability that is ten times higher than that of a disk with a damper. Because weight reduction is desirable in a center hub, ours has the most lightweight damper-less design. It consists of a main body composed of a carburized chrome-molybdenum material and an ultra-thin piano wire to anchor the disk. Made of a unique friction material developed by ATS & ACROSS. The enormous strength created by our non-mesh random-weaving method will prevent damage during driving. The ultra light carbon disk of only 160g total weight changes controllability and acceleration characteristics. The clutch has excellent friction characteristics even when cold so that it is always free of slippage at full acceleration and feels strong and stable. To attain high precision, we use our unique large-scale dedicated machining process capable of performing all fabrication processes (from lathe turning to gear tapping) in one chucking. This makes excellent dynamic balance possible. Optimal weight is determined based on the vehicle type and usage. In combination with its highly rigid cover, our flywheel is very resistant to distortion. The diaphragm is carefully designed to prevent cracks caused by concentration of stress and fatigue-induced damage from repeated clutch operation. Together with the pressure plate at its optimally-determined size, the diaphragm provides ideal clamping power and work strokes. The Pro-spec II is available in single diaphragm spring for a lighter-than-stock pedal effort. The beautifully colored pressure plate has the unique carbon coating (Pro-spec). Combined with the carbon disk, it greatly increases torque delivery. The pressure plate is totally re-designed for Pro-spec II for a higher leverage ratio. Our clutch cover has a compact and original design, and exhibits high rigidity characteristics established through aluminum forging and shot peening.